Call For Contributions! For a zine on disability and acceptance. We are looking for essays, illustrations, writing (max 1000 words), tips and resources on the theme of disability and acceptance. What helps people to accept their disability/impairment and what helps the creation of a sense of community around disability? We recognise that society is the thing that disables, or creates barriers for people, but welcome responses that explore the creation of pride in spite of this. 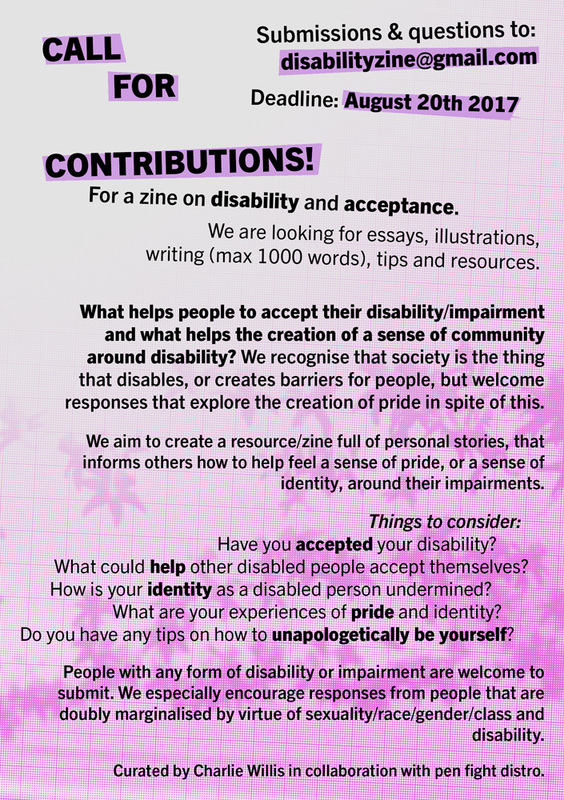 We aim to create a resource/zine full of personal stories, that informs others how to help feel a sense of pride, or a sense of identity, around their impairments. Have you accepted your disability? What could help other disabled people accept themselves? How is your identity as a disabled person undermined? What are your experiences of pride and identity? Do you have any tips on how to unapologetically ​be yourself? People with any form of disability or impairment are welcome to submit. We especially encourage responses from people that are doubly marginalised by virtue of sexuality/race/gender/class and disability. Curated by Charlie Willis in collaboration with pen fight distro.